This Episode is the third and final selection of Big Flame documents on women and feminism. It covers the period 1982-84. The periods 1975-80 and 1980-81 having been examined in Episode 4 and Episode 17 of this series. A previous post mentioned a Day School on Autonomy in July 1982 (see Episode 6). This covered the dual meanings of the term – working class autonomy and the autonomous movements. Here are two contributions to the latter aspect of the debate. One was written by a supporter of the “Facing the Challenge” tendency, the other the “Emerald Street” tendency (see Episode 27) for the general perspectives of these groupings). 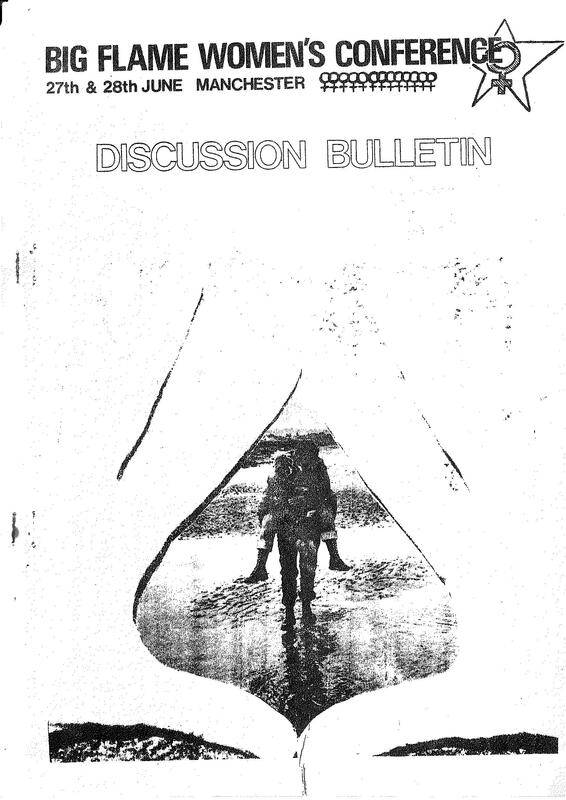 On Autonomous Movements: Discussion Bulletin June-July 1982. Looks at a range of different autonomous movements and tries to identify a material basis for their growth. For the women’s movement, this is the contraceptive Pill. For the black movement, the struggle against colonialist rule. For the movement of disabled people, a technological revolution which provided the means to overcome physical limitations. The writer believes that movements based around these oppressions, whilst not free of economism, are less likely to be restricted by it in their struggles. This is because they come up against deep rooted power relations within the culture and organisation of society. The task for BF is seen as building a relationship with those sections of the movements with the most advanced understanding of their oppression and the most politically socialist. 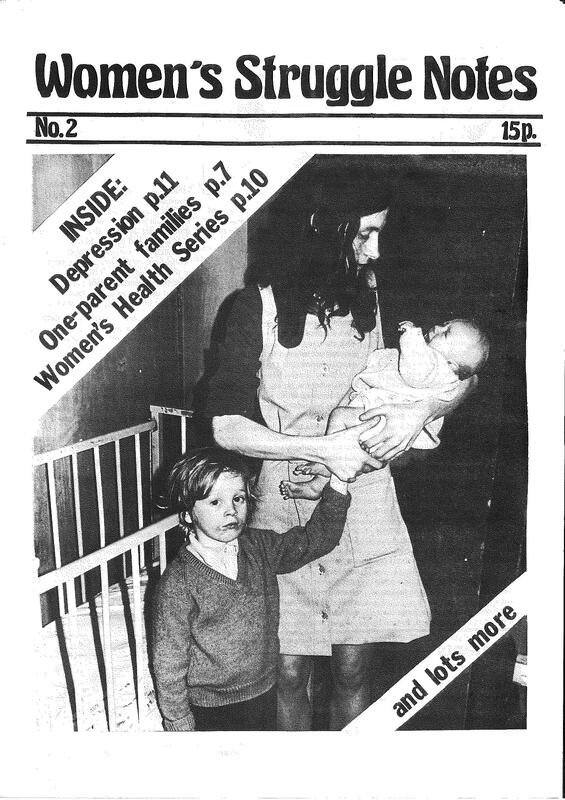 On Women’s Autonomy: Women’s Bulletin Spring 1982. Detects a confused and distanced relationship with women’s oppression within BF. As her experience of oppression is as a woman, women’s struggles come first. She is also committed to revolutionary struggle as necessary for all oppressed groups. A hierarchy of struggles should be avoided. Men don’t have the experience to create feminist theory, although they should organise themselves to undertake anti-sexist work. 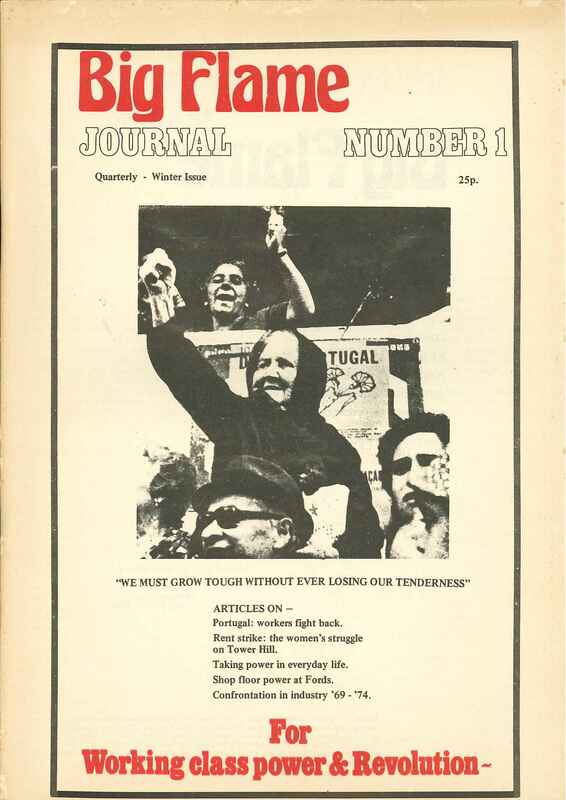 The final article was part of a discussion about a specific campaign of the early 1980s – an attempt to get the Labour Party to call for a demonstration around the slogan “A Women’s right to Work”, but it raises more general issue of the relationship with the Labour Party leadership and labour movement institutions. 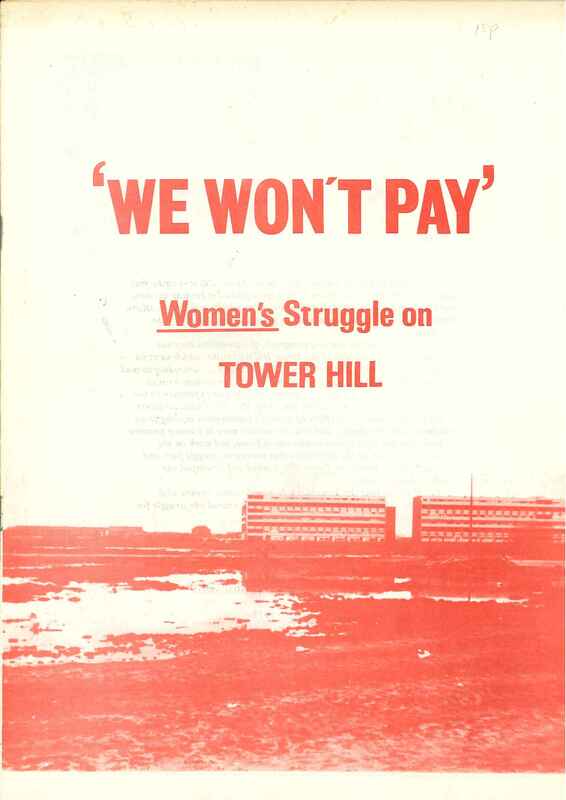 Women’s Right to Work and the Labour Party: Women’s Bulletin Spring 1982. The author is not opposed to attempts to get the labour movement to organise around feminist issues (although in this case preferring an alternative slogan which would substitute “Waged Work” for “Work”). However, calling on the Labour leadership to organise around demands they don’t believe in places too much reliance on that leadership and runs the danger of reducing popular participation and sacrificing the strength of women. 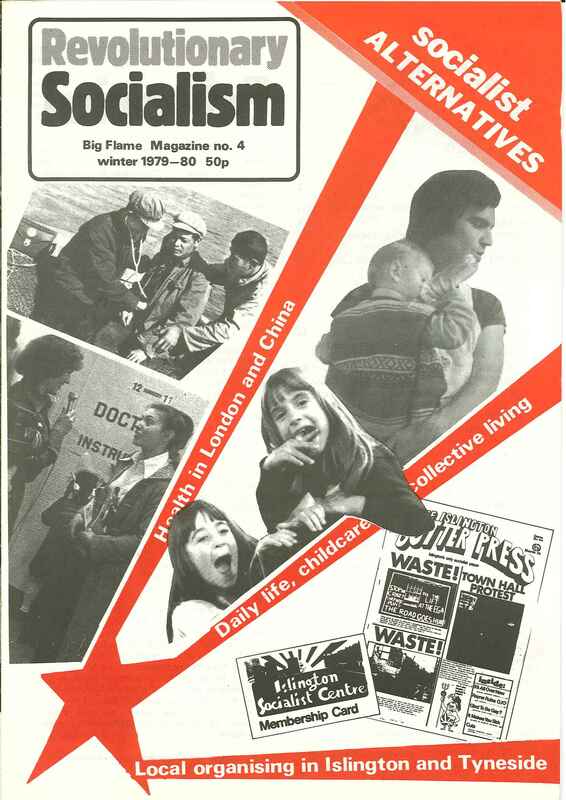 Episode 11 of this series examined one issue which was the subject of debate at the 1976 and 1978 Big Flame conferences – building a new, larger organisation. Another issue discussed at these meeting was the process by which people were appointed to its National Committee. This post looks at this debate in the context of a more general discussion of the group’s internal organisation. Along with an earlier post – Episode 8 in this series – it provides a basis for judging Big Flame’s relationship with Leninism. The early Big Flame had no constitution to set out formally the way it was organised. It adopted a Constitution for the first time at its May 1978 Conference. This was based on the one adopted by the Revolutionary Marxist Current (see post about the RMC), which had joined Big Flame the previous year. Click here to view Big Flame Constitution [as amended at the 1980 Conference]. The key decision making body within Big Flame was the conference. One was held every year from 1975 to 1984 apart from 1977 (when there was an open conference of the Project) and 1982. It was open to any member of BF to attend and vote (given the size of the organisation this never presented any practical problems). The format for conferences was fairly traditional – mostly large plenary sessions with voting on motions and amendments. The most important level of involvement in Big Flame was the local branch. The organisation constantly grappled with the problem of how to provide support to isolated members or small branches. Thus branches in towns like Brighton. Leamington and Oxford came and went, whilst those in the larger cities were usually constant throughout BF’s history. However, the way they functioned did change. The early branches adopted the base group model with members focussing their political activity on a small number of joint interventions. As time went on this was largely abandoned, with branches bringing together members with active in different struggles. Before Big Flame became a national organisation in 1975 and was a federation of autonomous groups, it established a number of commissions. These brought together from around the country any BF member who wanted to attend (and sometimes sympathetic non-members) and was engaged in the same area of political activity e.g. women, Irish solidarity, anti-racism/anti-fascism, industry, health workers, teachers, etc. Meetings rotated around the country and the structure was minimal (someone agreeing to be the convenor for a period, the chairing of meetings rotated). 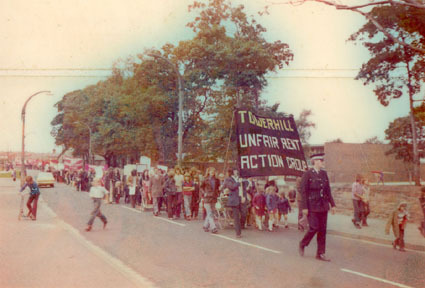 They became a vital source of support and tactical ideas for those who attended (particularly if no-one in the local branch was engaged in the same activity). Many of the Big Flame pamphlets were written jointly by Commission members. There was a tendency at the time for some writing about BF’s internal organisation to contrast the healthy democracy of the commissions with other things they wished to criticise. Therefore, it is worth remembering that Commissions were not without their own problems. Several reached a peak, fell apart and had to be revived later. Even when things were going well, there might be no more than half a dozen at any particular meeting, and these could be mostly different people from those who attended the previous meeting. The first section of the Constitution (see above) sets out the requirements of membership. This is fairly vaguely worded, and apart from the critique of “traditional models of the revolutionary party” are probably little different from many other left groups. Despite numerous efforts to improve internal education in Big Flame, it never developed a comprehensive education programme which might have clarified the grounds for membership. The norms of what membership of BF meant (in the later days at least) were fairly loose, and largely a matter for the individual member’s own decision. Another section of the Constitution sets out disciplinary procedures. As far as I am aware (and I have tried to do some research) no member of Big Flame was ever disciplined in any way, still less expelled from the organisation. Big Flame chose not to devote its limited resources to paying full timers. In its later days a National Secretary was paid. This was an administrative rather than a political post (for example, the National Secretary was not a member of the National Committee). The first informal faction meetings in Big Flame were one offs after the 1976 Conference when supporters of both Plan X and Plan Y (see Episode 11) met to assess the outcome. The Constitution agreed in 1978 included the right to establish tendencies. However, they were regarded with some suspicion. The conference rejected one amendment saying that whilst tendencies were permitted they should be discouraged, and agreed another which said that tendency meetings had to be open to any member of the organisation. The first formal tendency (called Tendency One) was established in 1980. 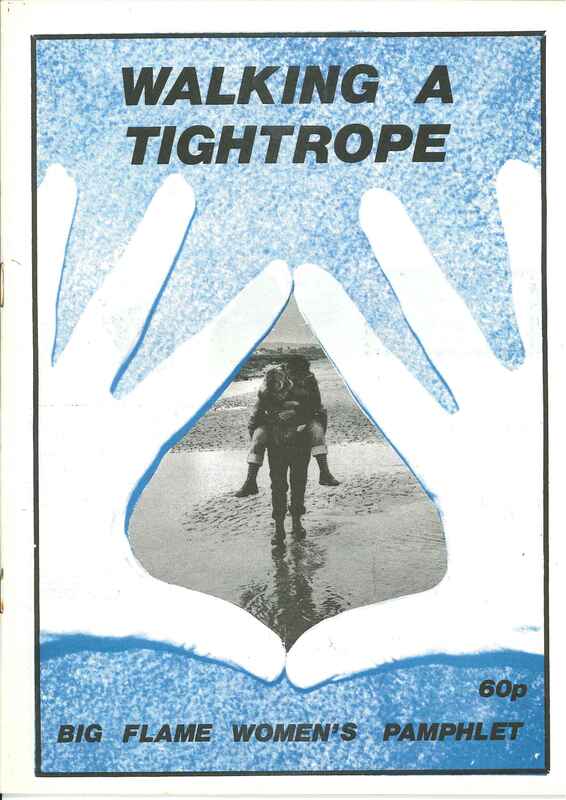 Although it broke up fairly soon afterwards, the proliferation of tendencies reached a peak in 1981 with a total of four (two formally declared). These developments will be covered in a later Episode in this series (see Episode 27). 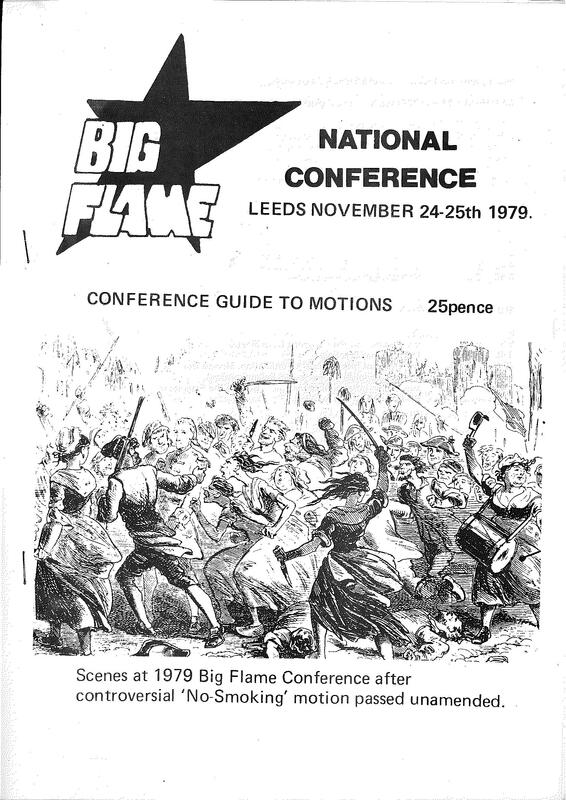 The National Committee (NC) agreed at the first Big Flame Conference in 1975 was based on delegates from local branches. In 1976 Plan Y supporters unsuccessfully raised the issue of a directly elected NC. The change to an elected NC of eleven persons was agreed narrowly (45 votes to 41) at the 1978 Conference as part of the new Constitution, with an amendment limiting continuous service on the NC to no more than 3 years. The movers of the new constitution described the proposed approach as “democratic centralism” and argued that the NC should be a body of “the most experienced and politically educated comrades” (1978 Conference document). Another supporter of an elected NC rejected the phrase “democratic centralism” (on the grounds no-one knew what this meant and most things associated with it were bad) and the emphasis on getting “the best” to serve on the NC (instead seeing the arrangement was giving the most democratic representation of different views) ” (1978 Conference document). Surprisingly little attention was given to problems with a delegate arrangement e.g. branches not having a single political view, a body appointed this way not necessarily reflecting the majority view. For example, despite Plan Y losing the vote at the 1976 Conference, the delegate NC arrangements resulted in Plan Y supporters being the majority on the new NC and given the responsibility of launching the Project. One opponent of the change saw it as “a massive over-centralisation of power” and creating a “self perpetuating leadership” and a “remote base”. BF’s perspective was based on leaders having regular experience at the base, and delegation created direct accountability. The change would lead to the same degeneration as had occurred with the International Socialists (1978 Conference document). How well did the structures work? After two years of the elected NC, one member attempted an honest assessment of how things were going. Click here to view National Committee (1980 Conference document). Perhaps a better way of seeing how the NC related to the rest of the organisation is to look at some conflicts which occurred. – The NC took a position in 1978 supporting the emergence of the Anti Nazi League. The Anti-Racist Anti-Fascist Commission (some of whose members had reservations about the ANL’s impact on local anti-racist work) reacted strongly against the decision, arguing that its members had not been consulted. The NC defended its position, arguing that its discussion had been flagged up with branches through the agreed procedures. – In 1980 the Women’s Commission after a debate agreed a paper for the National Abortion Campaign conference. 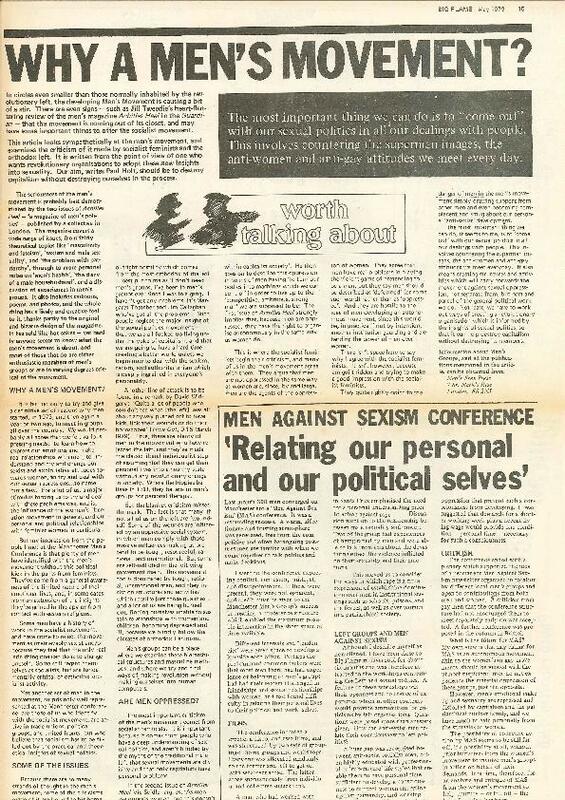 When discussed at the next NC, the women members present did not agree with the position set out in the paper. The NC as a whole decided that the paper should not be submitted in BF’s name. The NC subsequently decided that it had acted wrongly in not endorsing the Women’s Commission position. 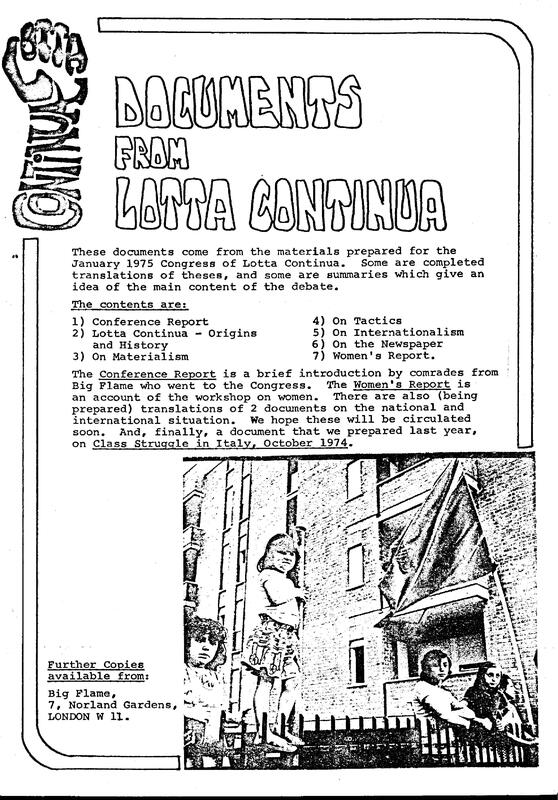 – In 1981 the NC asked one of its members to write an editorial for the newspaper. The Newspaper Collective decided that the article’s contents did not reflect BF’s positions and printed it as a signed article rather than editorial. The author (who argued that his article was in line with BF policy) was not consulted. The NC’s response was to agree new procedures to try to avoid a recurrence. It is difficult to generalise too much from these examples. At the very least they show an NC willing to admit mistakes and to avoid future conflicts where possible. Only in 1978 were there more candidates for the elected NC than positions available. There were constant problems finding women willing to stand for the minimum four positions reserved for them on the NC. In recognition of this continuing problem a motion was passed at the 1981 Conference reducing the number of directly elected NC members from 11 to 6. There were still problems with people resigning from the NC. So at its 1983 Conference Big Flame again changed its constitution to having only four directly elected NC members (one of them the Education Organiser). The NC was now a hybrid, with another five members being delegates. Only this time they were appointed by Commissions rather than local groups. In retrospect the debate about an elected NC was not one of the most illuminating in Big Flame history. An elected NC neither solved nor created Big Flame’s problems. Whatever, the theoretical merits of the arguments on either side, the organisation proved incapable in practice of maintaining an elected NC. BF, by its very nature, attracted a membership who were suspicious and critical of “leaders” and gave priority to local struggles. They believed in the idea of a national organisation, but sustaining and supporting it was usually not a top priority. 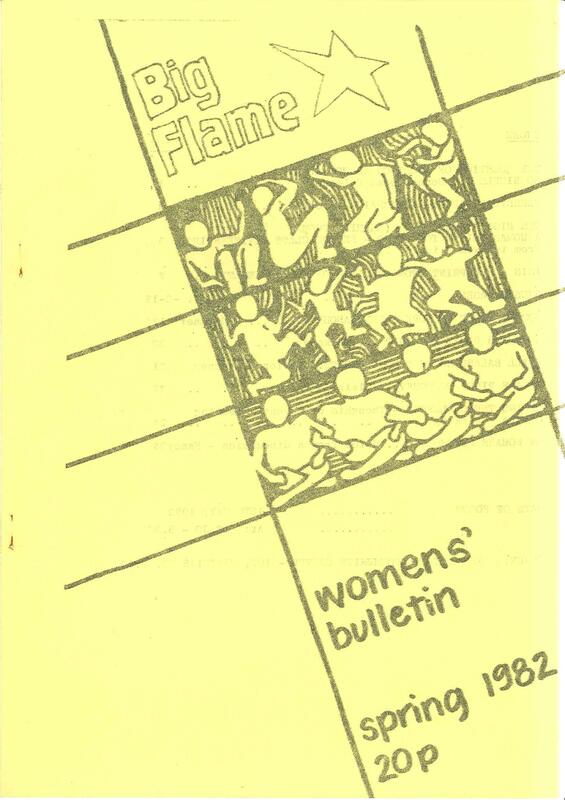 However, like every other organisation whatever the formal structures, Big Flame still included amongst its membership (and on both sides of its various debates) a number of confident, articulate (mostly male) people who exerted a significant influence on the organisation’s direction. This was despite the arrangements in place at the time for the NC and, indeed, whether or not these individuals were part of it or not. The best way of judging an organisation is not whether there are such formal or informal “leaders”, but how genuine and sustained are the efforts to involve a wider group of members in decision making. I think Big Flame was always trying. Although some individuals cited Lenin in their arguments for particular arrangements, the way the organisation functioned (under both the delegate and elected NC) was significantly different from the proclaimed Leninism of other organisations. It may have been in some respects a chaotic and not fully effective organisation. Maybe this was a fair price to pay for not adopting some of the alternatives.